Impressive distances are being flown at faster and faster speeds - and in conditions which are sometimes very challenging. At the same time, glide, stability and balanced damping for performance-oriented flying are becoming increasingly important so that pilots can reach the average speed required. 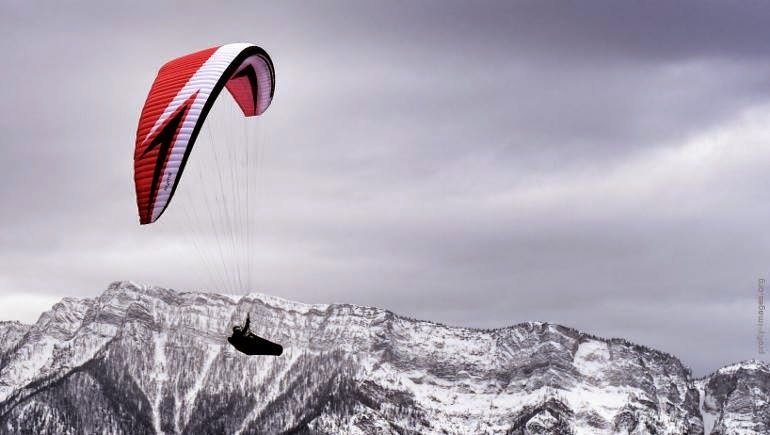 Our response to these demands is the NEXUS - a cross-country glider developed for tough conditions, which is reliable, intuitive and has better performance than ever, whether at full throttle, or when gliding or climbing. And the rougher the air, the more it is in its element! These features make the NEXUS an option for a very broad group of pilots, from experienced social pilots right through to ace cross-country pilots going after rec-ords. It is a true “all-terrain glider” for any distance and all flying conditions, which will also be appealing in pure racing. The new NEXUS makes any challenge fun. The complete control through the steering lines and the amazing stability of the canopy will mean that you consciously seek out rough conditions and turbulence. After the first taste of acceleration, you’ll be wanting to go at full pedal for any level flight, however short. The glide, stability and directional stability at full acceleration are so convincing that it is like being under a rigid surface. And at the same time there is such a high level of tolerance to changes in the angle of attack (i.e. to undercutting) that you could completely forget to release the speed bar at the next thermal. rigorous and systematic adjustments, testing and comparison in a wide range of conditions until we got the perfect result: field tests with the full variety of seated and prone harnesses, in high summer in the Dolomites and in the Abruzzo region, coastal soaring in South America and at altitudes up to 4,700 m.
The profile we used is a completely recalculated profile with double-3D-shaping for specific use with paragliders. It is the best compromise between stability and performance currently known. Lightweight materials have a tendency to become deformed after just a few flights and the wing’s glide decreases. For this reason we use lightweight materials only on the lower surface and in certain parts of the inner areas, so that there is the least possible loss of performance because of stretching. Wing tension was optimised individually for each cell of the NEXUS in small stages and repeat testing. 3D-shaping in the top surface and, for the first time, in the bottom surface: the 3D-shaping takes the tension out of the leading edge and reduces distortion of the inflated profile. The additional 3D shaping in the lower surface has proved valuable to give a balanced stress ratio and even less distortion. NCV Skytex 32 and 27 gram sail fabric, top quality from Europe. The NCV-fabrics are well-known because the quality, weight and standard of their coating in all colours reaches the standards promised. The somewhat higher costs are justified by the simple fact that loss of performance caused by diagonal stretch becomes measurable only after many hundreds of flights. The V-tapes are the extension of the lines in the canopy, in order to support the non- attached ribs. If they stretch, the glider becomes slower and loses performance. To prevent this, with the NEXUS all V-tapes are stitched down and given additional reinforcement. For the lines we have used an intelligent combination of Dyneema and Technora lines, from established European manufacturers. The new sophisticated speed system guarantees maximum glide at half throttle and (!) at full throttle. The C-handles on the riser allow the active flying typical in competition. The attachment of the stabilo line to the canopy and position of the main stabilo lines on the riser allow gentle turns at full throttle without any loss of speed or performance. Ready to experience the difference for yourself?